NYC Health & Hospitals implored state officials on Friday to release approximately $380 million in unpaid Medicaid disproportionate-share payments, saying the held-up funding is making its "precarious financial situation" even worse. NYC Health & Hospitals interim CEO Stanley Brezenoff said the nation's largest public health system has yet to receive $380 million in DSH payments for this fiscal year, which ends Sept. 30, because they are "awaiting action" from New York's State Department of Health and the Division of Budget. DSH and Upper Payment Level supplement Medicaid payments account for about a third of NYC Health & Hospitals' $8 billion operating budget, according to Brezenoff's letter to state Health Commissioner Dr. Howard Zucker. Without the DSH funding, which was designed to help offset safety-net hospitals' uncompensated-care costs, the provider is going to have to be more "stringent in judgment calls around expenditures," Brezenoff said. "I simply can't get my arms around the fact that other hospitals in the state, some that have bottom lines on the plus side of hundreds of millions of dollars, are receiving this disproportionate-share hospital funding, and we are not," Brezenoff said in a meeting with the system's board of directors Friday morning. The fact that the state has no financial stake in these payments only adds to the mystery of these delayed payments, he added. All voluntary and major public hospitals except for the State University of New York hospitals and NYC Health & Hospitals have received their allocations, according to the health system's letter. State officials didn't comment on the withheld DSH payments, but noted that New York faces "devastating" cuts to its DSH funding starting Oct. 1. New York will receive $330 million less in fiscal 2018 and $829 million less in fiscal 2019, according to the state Department of Health. DSH funding has been on the chopping block for years. The cuts that were initially planned for 2014, banked on the assumption that providers would need less financial support once more people were covered under the Affordable Care Act. But hospitals and health systems have argued that this hasn't been the case. DSH cuts have been repeatedly delayed. Now, the reductions will go into effect on Oct. 1. While uncompensated costs have dropped, DSH funds remain vital, according to a recent report by the Medicaid and CHIP Payment and Access Commission. The group urged the CMS to recalculate the DSH payments based on how well providers' value-based care initiatives are working, rather than tie them to uncompensated care. "These cuts will jeopardize access to care and vital community services—trauma care, disaster response and others—in all states," Dr. Bruce Siegel, president and CEO of America's Essential Hospitals, said in a statement. The delayed DSH payments are more bad news for NYC Health & Hospitals, which had to eliminate nearly 600 positions so far this year and restructure its bloated management structure. The staffing cuts were part of a plan to close a projected $1.2 billion budget deficit in 2018 brought on by "high costs and inefficiencies" in the health system as well as payment changes at the federal and state levels, Brezenoff told the New York City Council in a May budget hearing. Like other systems, NYC Health & Hospitals has excess inpatient bed capacity and it plans to invest in outpatient, post-acute and integrated social services, he said. "Disproportionate-share funding is a fundamental part of the foundation of financing for the operation of Health & Hospitals," Brezenoff said at Friday's meeting. "We have learned that the state is not going to provide in the time frame that we have expected $380 million that we have in effect earned, deserved, have counted on as part of our overall financial plan." The health system is one of the biggest providers for the uninsured and Medicaid beneficiaries and offers an array of services like trauma and burn centers that are under-reimbursed, he added. The looming DSH cuts coupled with the pending rollback of the 340B drug discount program and the uncertainty surrounding the Affordable Care Act means hospitals have to play it safe, said Dr. Kenneth Davis, CEO of Mount Sinai Health System, also based in New York. Funding changes like these can put a system with a small positive margin and a large share of Medicaid and uninsured patients deep into the red, he said. "It means we have to be extremely conservative for a system like ours," Davis said. 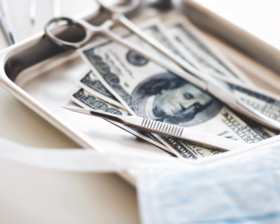 NYC Health & Hospitals has 18 days of cash on hand; it has already restrained payments to its vendors, and further delay could compromise service while cutting more staff could jeopardize basic operations, Brezenoff warned in the letter to state officials. "It's hard to imagine (not getting) $380 million will not be making a difference in what we can do, how we do it and when we do it," Brezenoff said.